It is creamy. It is rich. It is the perfect hot drink at the peak of Winter when you are snowed in and bundled up on the couch watching a movie. Eric has not stopped talking about this Hot Chocolate all year, so I knew that I would have to roll it out again this Winter. This time, I made a Chocolate Peanut Butter Hot Cocoa because it just sounded like the right thing to do. Despite the fact that Eric is actually repulsed by peanut butter on its own, he actually loves the combination of chocolate and peanut butter together. I don’t ask, I just bake. Adapted from Tall, Dark, and Handsome Hawt Cocoa. Directions: Sift the cocoa powder. This step is key so it is not clumpy! Throw all ingredients into a pot and whisk like crazy. Bring to a low boil and then simmer on low for several minutes while whisking to remove any remaining clumps. 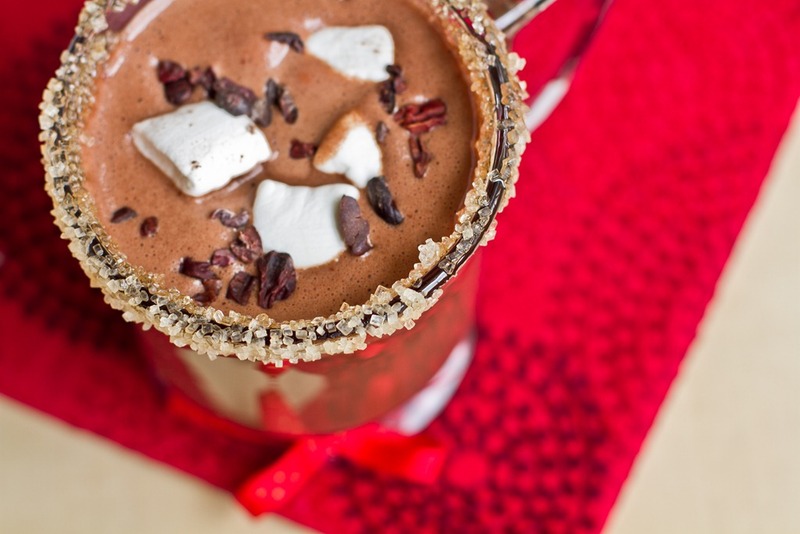 Pour into 2 mugs rimmed with agave and Turbinado sugar and top with marshmallows, chocolate chips, and/or cacao nibs. Enjoy with a spoon! Makes 2-4 servings (3.5-4 cups). It is very important that you sift the cocoa powder before beginning. I tried to skip this step and it was horribly clumpy. No one wants to bite into a clump of bitter cocoa powder! I ended up pouring it into my blender to get the clumps out, but I learned my lesson. 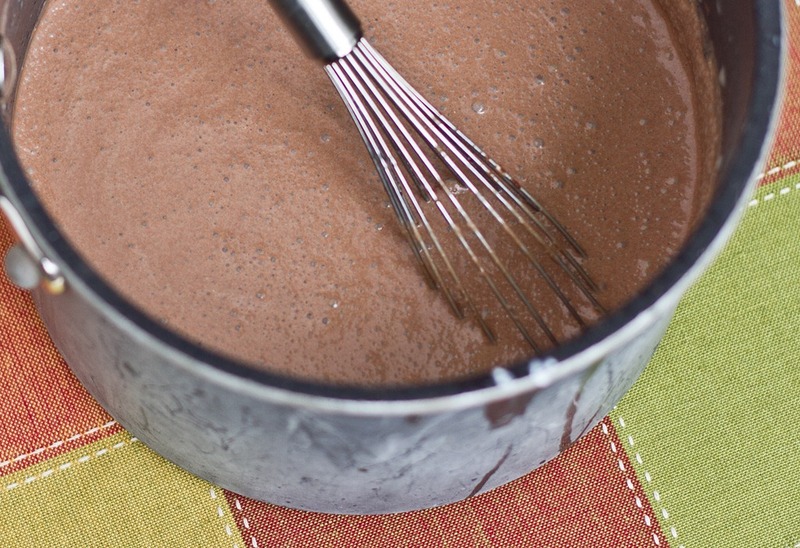 Whisk all ingredients together in a pot and bring to a low boil before reducing to low heat. Simmer for a few minutes. I rimmed the mugs in agave and then turbinado sugar. It worked out great! I also added a bow at the bottom of each glass mug. On top: Dandie’s vegan Marshmallows and Cacao nibs. You can also add chocolate chips on top too. Mmm. I love Dandie’s marshmallows. They get all soft and melty in the hot cocoa. This cocoa is smooth as silk, creamy, rich, and chocolaty, with just a hint of peanut butter. Perfection. But of course I could not leave it at that. I decided to pour the hot cocoa into an ice cube tray to make delicious ice cubes of fudgy goodness. I made them into Rocky Road ice cubes by adding marshmallows, chocolate chips, and cacao nibs. Freeze them for a few hours and then use a dull butter knife on each side to pop them out. 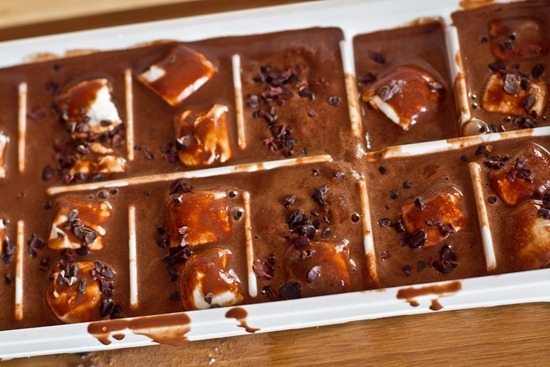 The result is a delicious Rocky Road fudgisicle cube that you can enjoy alone, make into popsicles, add to a glass of Almond Milk, or throw a couple into a SMOOTHIE! The possibilities are endless. I’m off for a meeting this morning. I am being interviewed by my undergraduate University- University of Guelph for OSG and Glo Bakery. 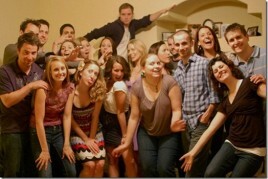 It should be really fun to reminisce about old times! Any U of G students or alumni out there? 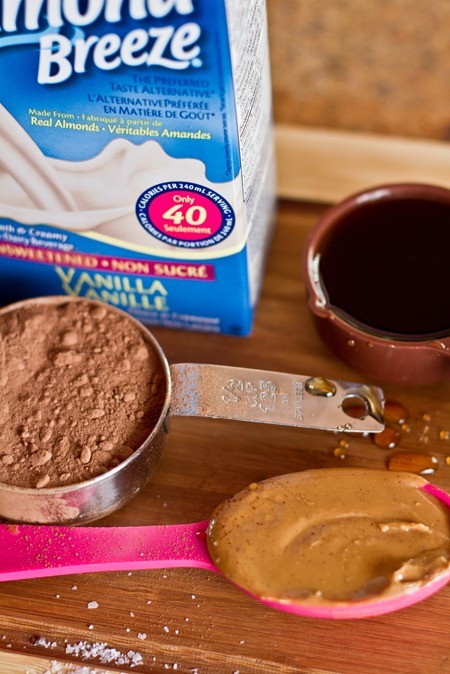 I cannot wait to make this PB hot chocolate. It is just what I have been craving lately. Thanks for this lovely recipe! will definitely stop by again soon!!! This looks delightful! I made a similar salted PB hot chocolate recently and it was wonderful, but I’ll have to try your version. More PB and coconut milk can never be a bad thing! WOW Ange, good luck with your interview! I’m sure you are one of the most accomplished U of G Alumni out there!! 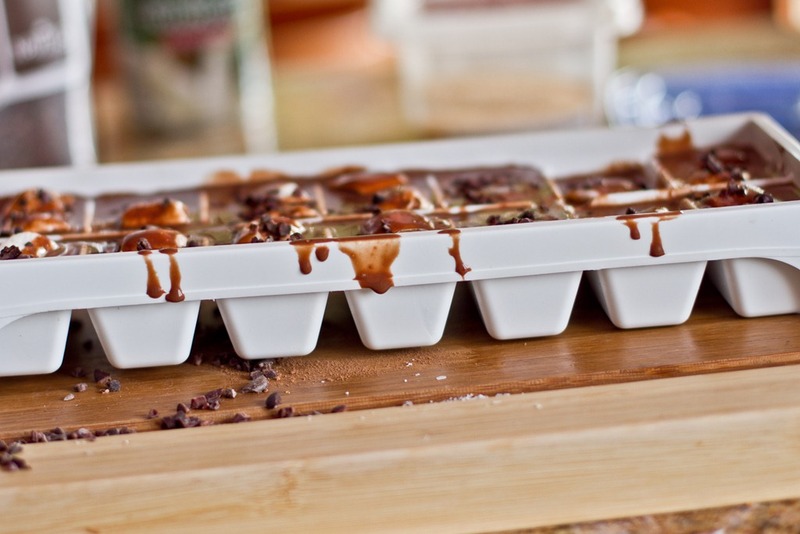 And I think the cocoa looks amazing – genius idea with the ice cube trays! This looks amazing. good luck with the interview! woot woot! I went to Guelph for my undergrad degree and studied International Development. I am now at McMaster studying midwifery- but I definitely miss the small town, earthy feel of guelph! 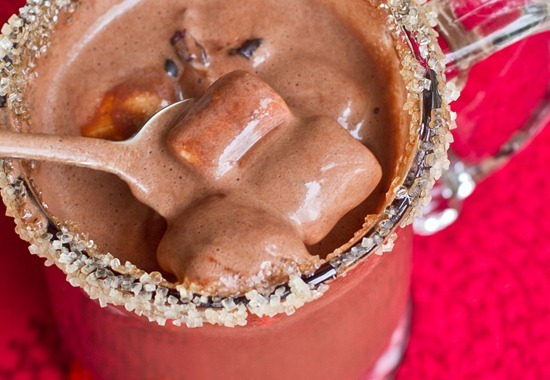 Oh you could totally make frozen hot chocolate out of those ice cubes! That recipe title it too cute :) And I love the sugared glass idea! I made salted pb hot chocolate a few weeks ago and it was SO good. 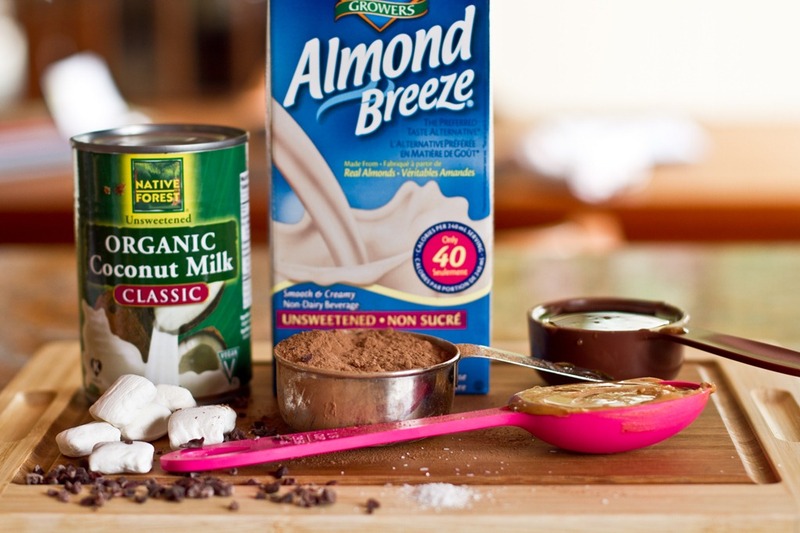 LOVE the idea of using coconut milk… I’ll do that next time for an even creamier version. Oh yum! That hot chocolate looks amazing! That looks AMAZING!! YUM! I haven’t had hot chocolate all winter! Can you believe it? I live in Chicago…. You must remedy this situation at once! That hot chocolate sounds sooo good. Definitely have to make this! WOW! This is brilliant! 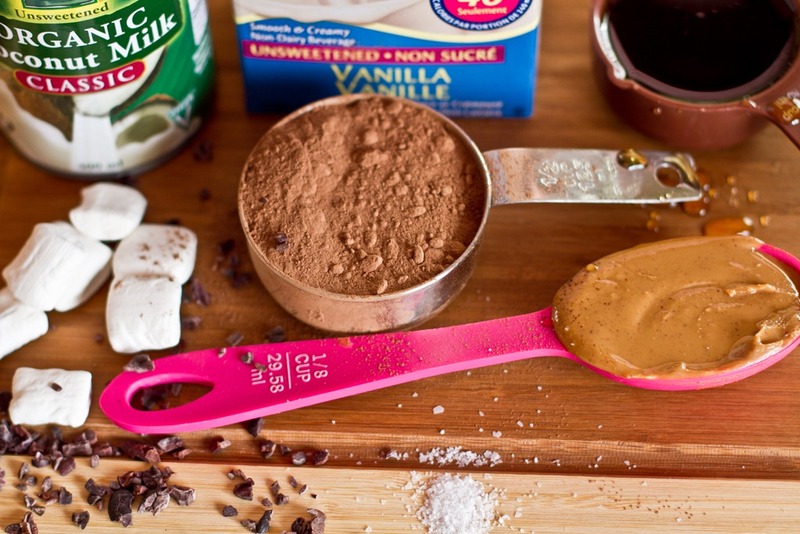 Love the idea of using coconut and, of course, peanut butter! I am OBSESSED with the sugared rim! So fun. the rocky road ice cubes are genius! you always have such innovative ideas! OMG rocky road smoothies!!! You are a genius! I have to admit though, with the cocoa nibs and marshmellows it looks a little crazy but it must taste ah-mazing! Peanut butter in my hot chocolate? Ummm….yes please!!!! I will be making this very, very soon. ohhh these look s good!! 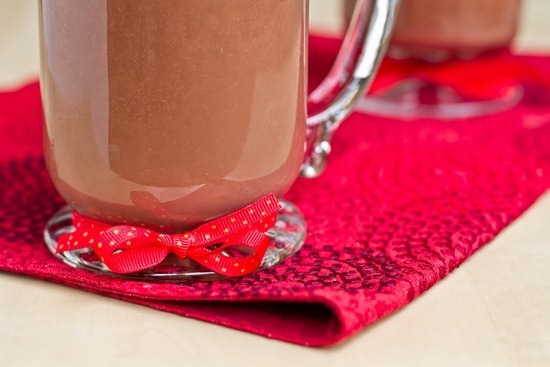 Yummy hot chocolate – I must try that for the boys as I know they will love it! 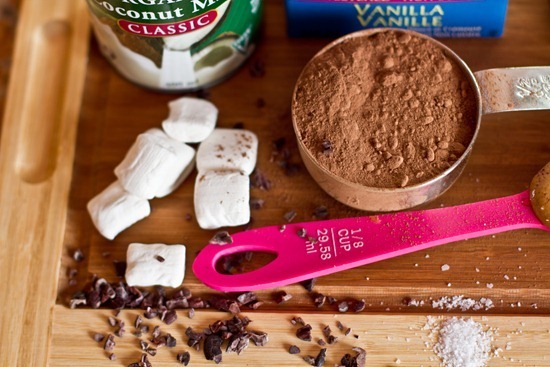 I totally had a craving for hot chocolate recipe yesterday! But I didn’t know of any amazing recipes. Thank you for sharing! That’s the most beautiful hot chocolate ever! Thanks for sharing this recipe. This is exactly what I need on this cold day. I am so impressed by your photography. 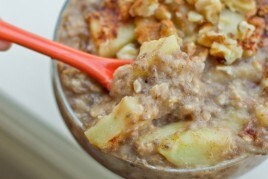 All of your pictures just look absolutely gorgeous and this recipe looks unbelievable! 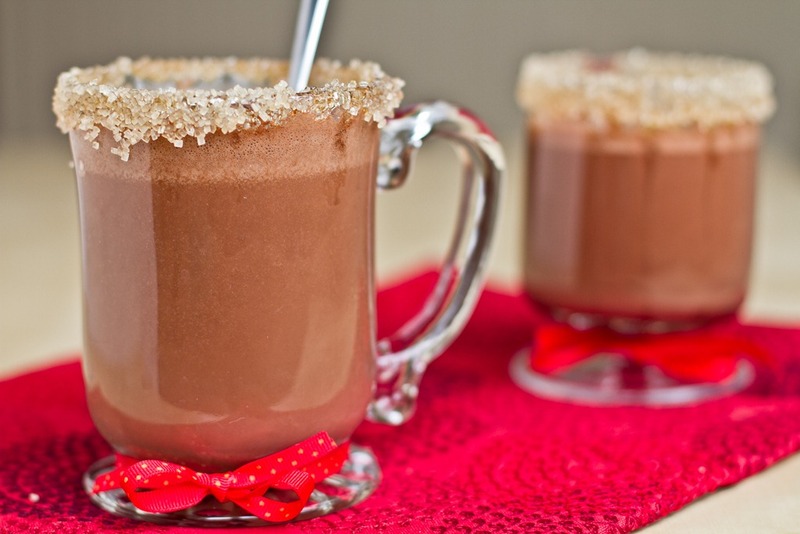 I have never tried Peanut Butter hot cocoa! Sweet! How cute with the ice cubes and really a smart idea. Your presentations of all your foods are beautiful! Oh myyyyyy Angela. Your recipes always look amazing but I’m sure this one takes the cake!! I die over chocolate and peanut butter so in liquid form?? Yes please! ow WOW WOW WOW WOW! I especially like the idea of freezing them! that hot cocoa looks so amazing!!! Oh Yay!! You’re a Guelph alum! I am there right now, in my last year of a Masters of Landscape Architecture degree. ALL OF THE GLO BARS ARE SOLD OUT! what a great idea making the “ice” cubes! that would definitely be my go-to snack! So creative! Those ice cubes would be gone in an hour for me, and this hot cocoa would be wonderful on days like yesterday when it was below zero degrees F all day. omg, that looks so incredibly rich and decadent. I love the way your brain works, Angela. hmmmmm peanut butter….. hmmmmm chocolate. Hmmmm peanut butter + chocolate. so pretty. Oddly enough I love peanut butter, and I love chocolate..but not together. heh. The turbinado sugar rim takes this drink over the top! Yum! I can see why Eric would be talking about your hot chocolate all year. This looks fabulous! Have fun on your interview! Where was this mug of hot cocoa when I was in Ottawa yesterday??? I love that pink measuring spoon! 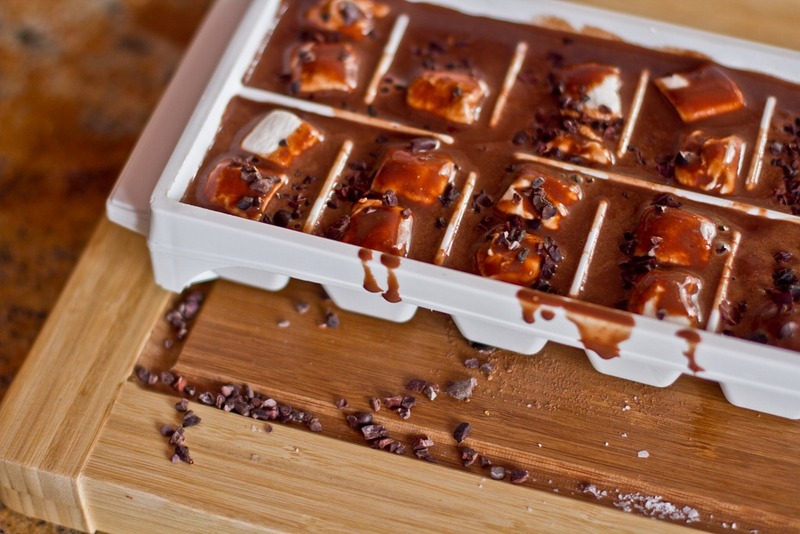 Also, I must say those rocky road ice cubes are simply gorgeous! I KNEW I could count on you for some Valentine’s Day goodies :) I’m in love with chocolate, so this one-way relationship may be detrimental. On the other hand, I think chocolate just wants me to bulk up for all the snow we’re having… right? This sounds amazing!! I’ll be making this soon. Just an FYI. Most marshmallows sold in the grocery store are NOT Vegan or Vegetarian. They contain gelatin which is made from collagen a substance found in the connective tissues and flesh of mammals. Jello/gelatin is not animal friendly. You can find vegan marshmallows online and maybe at some whole foods markets. Sorry to be a bummer. Just wanted to throw that out there. I apologize. You don’t need to add my comment you do clearly state that you used vegan marshmallows. I have found that many folks don’t realize marshmallows are generally not a vegetarian item. My mother still doesn’t understand why I can’t just eat around the chicken in her cheesy chicken casserole. (Yeah I’ve been vegan for 12 years I don’t think she will ever get it.) Sorry to be all vegan police on ya. np :) Dandies are so yummy…have you tried them? What a brilliant recipe! I bet it’s delicious!! Oh.My.Goodness. 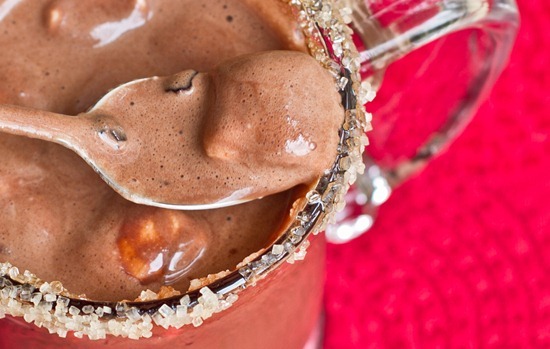 I heart chocolate and pb together so you’ve got me drooling here. 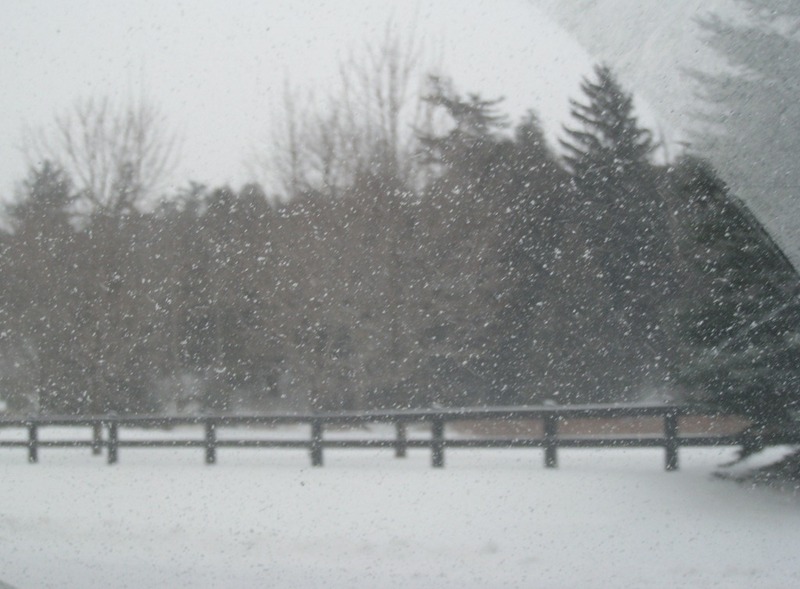 There’s no snow to watch while snuggling on the couch but I’ll still take a chocolate peanut butter hot cocoa any day! I’m in the UofGuelph library as I read and reply to this post right now! I transferred here this year from Western, and I absolutely love it. It’s definitely one of my best decidions I’ve made in my life. But I was so surprised when I read that part about you coming here today, it just seems kind of…surreal? lol :P I’m really happy for you being interviewed, I’m sure you’ll do great! Will you be visiting any of your old profs? Why does everything you make look so perfect, so delicious, and so wonderful? I’m really poorly today with tonsilitis so am going to ask my husband very nicely if he’ll make me one of your hot chocolates tonight as I am sure it’ll make me feel better! Ahh – wow, amazing. This is possibly the most perfect hot beverage everrrrrr. This looks gorgeous and sinfully good, I just might need to try it soon. Thanks! oh boy that’s killer hot chocolate! Here in cali it’s breezy but purty sunny~what else is NEW? :P But that doesn’t mean I can’t make hot chocolate for my luvd ones right? This looks perfect! My fave hot chocolate is salted caramel! And rocky road icecream!! you are a genius! Good luck at your interview! OMG I need to make this!!!!!!!!!!!!!! I love the thought of hot chocolate made with coconut milk!! Mmmm and freezing in ice cubes trays is a genius idea! The addition of a couple of those frozen cubes would make my already delicious smoothies that much better!!! Cant wait to try this! You make that mug stand out – so pretty! Chocolate and pb is my favorite combo. Oh yum! I haven’t had hot chocolate since I started eating a more vegan diet but I clearly need to change that! Chocolate+peanut butter=love. I’m a U of G Alum!!! Class of 2006 to be exact! ;) I still miss that place to death! those 4 years were definitely 4 of my best so far. That cocoa looks incredible btw! I love the ice cube tray action! Omg that is genius! I totally need to do that! I do that with leftover coffee. I make coffee ice cubes and then use those the next day to chill my ice coffee. Your recipe…kinda blows that away! But seriously, huh?! That’s not possible! This looks so delicious! Love the rim! OMG the sugar rim looks amazing!!! Eric is one lucky guy to taste these things!!!! Have a great day. That looks SO delicious. And the presentation is stunning, it’s like an art. My cousin went to U of G for a year as an “exchange” student. He is from Louisiana and his girlfriend from Canada so they each went to each other’s schools for a year. They met because they were pen-pals starting in the fourth grade! How adorable is that?! They started dating in seventh grade and are now married with a little girl. They live just outside of Toronto. Those cubes would be GREAT in iced coffee!! Good luck with the interview! What a great touch with the bows and the sugar rimmed glass ! 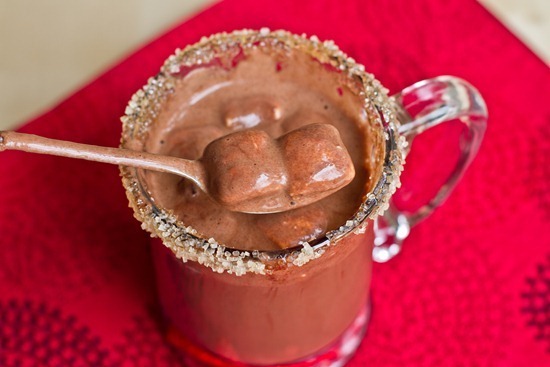 This hot cocoa looks so amazing. It’s exactly what I need to get me through the end of winter!! Ohhhmaigawd, jackpot! I love chocolate and pb (pb cups, yum! ), and this would be scrumdiddlyumptious! I feel naughty just looking at those pictures. Delicious and decadent is how I like to describe anything that looks that good. I would talk about it non-stop, too. Good luck with the interview. I have an award for you. Please stop by! Thanks for your feedback (even if it stings). anytime you can add PB to chocolate I’m all for it! You could rim the glass with graham cracker crumbs and call it a liquid s’more! That hot chocolate sounds amazing. You take the best pictures and I love how you add all those little touches like the bow! this looks divine and romantic! I have to admit, I got really excited when I thought this was a sea salted hot chocolate recipe, but a turbinado rim sounds tasty as well! holy yum! This looks amazing! making it on thursday’s snowday with the boy! Oh my goodness that looks AMAZING. Seriously- a dream in a glass. I am a University of Guelph student, go Gryphons! What’s the interview for? Hope it went well! Angela… I don’t know how, but you need to somehow start selling this in Australia. I promise to buy in bulk ;) Peanut butter hot chocolate, be still my beating heart! Both hot chocolates sound so good! Normal hot chocolate already sounded pretty yummy to me. How do you come up with these ideas? U of G alum here! Love that you’re being interviewed – is it for the Portico? That hot chocolate looks amazing! Mmmm I can almost taste it now! And we can’t forget palace and the underground! I have the exact same aisle photo from my UoG grad (I think the same dude in the background too! )… and on another note, this recipe looks beyond amazing! 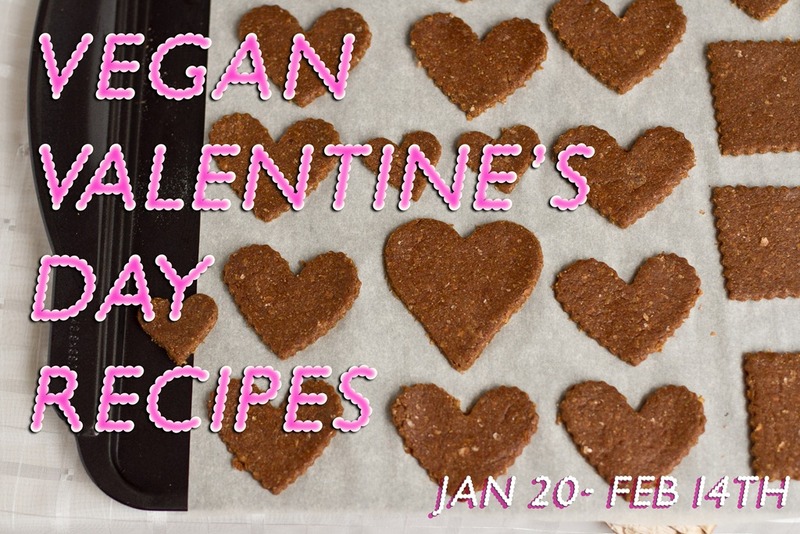 Your recipes always make me swoon! I can’t even put into words how amazing that hot chocolate looks!! WOOT! U of Guelph! 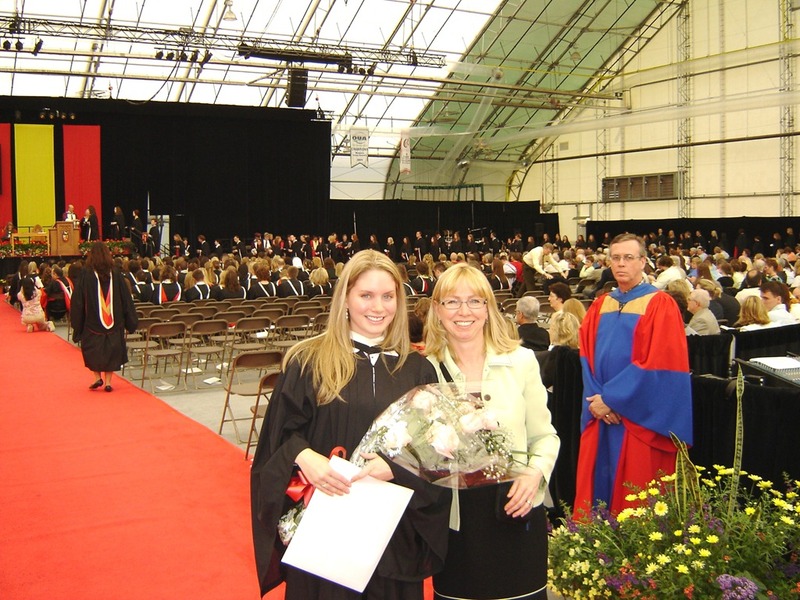 In my third year of my undergrad – thinking of getting my grad at U of T! Ohh hot cocoa is theeee best wintery bev. I drank it all summer (dont call me crazy – why not?! 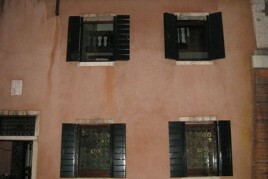 ), but that ice idea is brillll! OMG that looks AMAZING chocolate and peanut butter is the best combo ever, and I love the sugared rim. Wow both options look awesome, yum. You, my dear, are a genius. 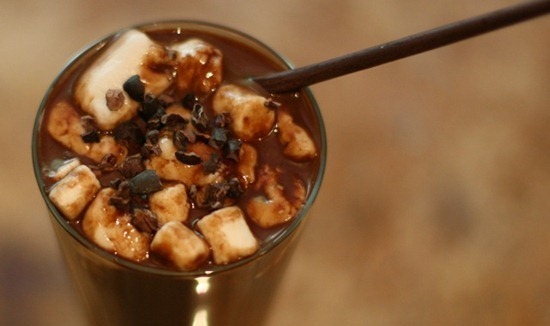 That hot chocolate looks so good, wish I found this before I made instant :( Love the rocky road ice cubes!! Gosh Angela, you take such pretty pictures! It’s seriously stunning! At some point you spelled marshmallow as “marshmellow” in the post- which made me smile and think thats how it should be spelled all the time! What could make you more mellow than a marshmellow? Especially in some delish hot cocoa. It is snowing like the dickens here in Boston, so I’ll have to make that soon! haha whoops I always do that! This stuff is a-mazing. Thank you!! I’m so glad I found your site! 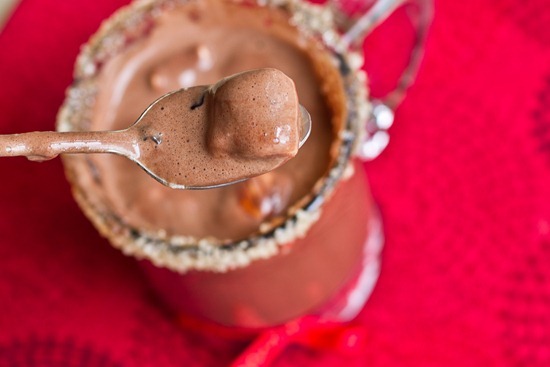 I’ve tried this peanut butter hot cocoa and it was SO GOOD. Will make it everyday….I do mean EVERYDAY. Love this post – so festive! When I saw the ice cube tray though, I immediately thought I’d share a link to the most amazing ice cube trays. I was freezing quite a bit of stuff in my trays as well, but kept finding the popping out to be rather tricky.. Then one day, my mom picked me up these Orka Ice Cube Trays, and life has never been the same :) Instead of being 100% silicone (which I don’t like either) they just have little silicone bottoms, so you can easily pop out the frozen food stuff… I love them!! Any who, thought I’d just pass it on! I realize you posted this long ago, Angela, but I only recently discovered your blog and have been eyeing your recipes for the last couple of weeks. Given the season this was my first try at one of your creations, and I was floored. Delicious, decadent, and satisfying! My husband loved it as well. I can’t wait to try more recipes. 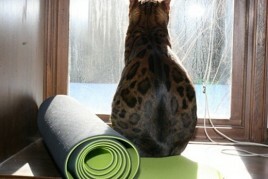 With gratitude to you for sharing your talents! Made this tonight for my two daughters. It has been snowing non-stop the past week and this was just perfect. First of all, I”m a HUGE FAN of your blog, and have directed others to it. Third, um, peanuts are in the same “family” as soy – legumes. I first reacted to peanut butter…after eating it all my life…but my allergist said that I’m allergic to soy. As in, I go to the hospital. I just made this hot cocoa for my running group for our after- run treat and it was amazing. I cannot get over the richness and thickness of it. I sugared the rims of our glasses too and it was just heavenly. Thank you so very much for your amazing recipes and your amazing book which I just bought, yey :). I just made these for a Bonfire hosted by my yoga studio. They went over so well, I didn’t even get the chance to try the ice cube idea. Delicious!